If there was any doubt that Maurice Edu is pleased to be with the Union, Tuesday’s presentation of the Union’s newest member surely put such concerns to rest. Edu spoke of the recent return of national team players Clint Dempsey and Michael Bradley and how his own return may help his national team prospects. 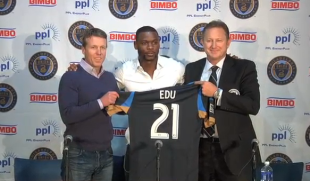 Reports from Maurice Edu’s presentation to the media on Tuesday at Philadelphia Inquirer, Philadelphia Daily News, Philly.com, Delco Times, CSN Philly, Philly Soccer News, MLSsoccer.com, ProSoccerTalk, and The Examiner. You can see video of the presentation at the Union’s YouTube channel. France Football (crappy Google translation here) reported on Tuesday that Vincent Nogueira has agreed to a two-year deal to join the Union. According to the report, the sticking point is that Sochaux manager Herve Renard wants Nogueira to play against Nantes on Saturday while the Union want him here now. At Union Tally, Matthew De George had some observations from Tuesday’s training session. Among the highlights: Andre Blake is actually 6′ 1”, not 6′ 4″; Blake and Zac MacMath appear to be working well together; Pedro Ribeiro is huge; the other draftees all add size and physicality to the team; Danny Cruz and Fred impressed. Former Union goalkeeper Oka Nikolov has signed with the Fort Lauderdale Strikers of the NASL. They seem to like former Union players there. Chivas USA presented new head coach Wilmer Cabrera on Tuesday. Looks like Toronto’s BMO Field could be shared with Canadian Football League side the Toronto Argonauts starting in 2017. That’ll do wonders for the pitch. More news on MLS hopefuls Atlanta, San Antonio, and St. Louis. In other concerning USMNT player news, Goal.com says its time to worry about Jozy Altidore at Sunderland. ProSoccerTalk says Clint Dempsey is barely even a noticeable figure at Fulham. From the nice news front, Fabian Johnson, who broke his hand on Saturday, could be available to play this weekend and Stuart Holden is at the USMNT camp as a guest player. Brek Shea’s loan spell to Barnsley has been extended by two months. A transfer scam involving Tottenham, FC Twente, a “rogue group” of player agents (including one based in the US), and forged documents. Incredible but true. More here. The Far Post looks at the boom in Chinese-funded stadium construction in Africa. If Fred comes back, the Union must be close to their international player limit, right? Do Blake and Ribeiro count as international players? Is it certain that Fred is in training? Last I heard nobody was sure if that was him in that picture that making the rounds. Yeah, it’s definitely him. We got a list of trialists this morning. He’s on it. We’ll get it out to y’all as soon as time allows. Blake and Ribeiro certainly do, if signed. As of right now I believe the international players are Fabinho, Hernandez, Madiana, and Daniel. Ekra and Fernandes have been released but are trialing with the Union, so technically they are not signed and using international slots. Valdes is the only other international but since he is on loan, he won’t count as an international slot. Le Toux, Lahoud, and Hoppenot are all considered U.S. players through green cards. And if/when the Union sign Nogueira he should also take up a slot. So assuming all players are re-signed, that’s a total of 9 international rosters spots. So a trade would be necessary to keep all players. More likely that a player like Fernandes or Ekra won’t be signed. As far as I know he’s an international, but I could be 100% wrong. Fred has a green card so it wouldn’t affect the international player limit. The DOOP song – The only remnant of Peter Nowak that we will never be able to get rid of. I often say that the only good, lasting thing Peter Nowak did for this team was the Doop Song. Just because he dismantled a promising young team piece by piece doesn’t mean we have to throw out Doop. I might be in the minority, and I get it’s never gonna go away, but I hate that song. It makes me think of Nowak every time I hear it. Of course I think the catch phrase “re-doop” is even worse. But alas today is about joy at getting a new midfield! So if the European window closes, how would that be possible? Transfer rules are sort of hazy to me still, but I thought – essentially – if a player on a Euro-based team wasn’t transferred out by Jan 31, he was there until the end of the season? Players can’t come into European clubs after that date. Most teams however want to also firm up any players leaving during that period as well. Souchaux could also choose to mutually terminate the contract. Letting Nogueira play another game in France would be a bad idea IMO. With a DP contract and a 2 year deal, they cannot risk him suffering an injury for one more appearance at Sochaux. Hopefully the player is on the Union’s side on this matter. I’d prefer the Union be on the player’s side, whether he wants to play another game in France or not. If the guy really wants to play (maybe it’s in his hometown or something), the risk of injury is worth the feelings he’ll have about the new club. If the guy wants to GTFO of Sochaux now, then the Union should support that, too. A quick glance at Wikipedia says that Nogueira has played for his entire senior club career at Sochaux (since 2007), is one of the captains, and is a fairly local guy from a town pretty close to where the club is based. I’m speculating wildly here, but maybe there’s a chance the club and/or he wants to do some sort of sendoff before heading across the ocean for someplace he’s never seen before. I’d say if something like that might be going on here, let’s not sour a two year deal right at the start by being jerks about it. Can anyone from PSP tell me or find out where the hell Amobi has been the past two days? I guess I appreciate the Daily News having someone write about soccer, but John Smallwood is just terrible at it. Yes, they killed it. But they have left a gaping hole at LB and a weak spot at CB. As much as I would like to keep Carroll around for flexibility/depth, there are two much better uses for $170k in cap room. Good news, we still have a full transfer window to fill those holes. I’m not at all sure LB is a “gaping hole.” Ray Gaddis is at least average – probably slightly above average – when compared to the rest of the league. So with all these singings, there is still one spot on the field that concerns me: RM. Obviously LB is a concern, but I think Gaddis can handle that position for now until we acquire a true LB. But at this point, without knowing the trialists, Carroll is the D-Mid, Maidana at LM, Edu at CM, and Nogueria at CAM, which leaves only RM open. Danny Cruz was the clear choice last year despite at least 2 players on the team who were better options (Seba, Marfan). It concerns me to think that when March 8th rolls around Danny Cruz will once again be our starting Right Midfielder, and CLEARLY the weakest player on the field. I would rather it was Marfan, but I think its safe to say that Seba is the starting RM.